Replace your Kohler Muffler with a new one from Jack's. 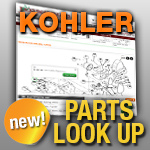 We're stocked with mufflers for a variety Kohler small engines. If your equipment's exhaust sounds too loud, check out the muffler for any holes, leaks, or cracks. Search for your replacement muffler and accessories below.